This past week's Earth Day festivities, ongoing since the first Earth Day in 1970, are meant to call attention to our planet and to urge us to be kind to it. It is life-giving in that we derive our sustenance from it, either directly or indirectly. Did you do anything special to observe Earth Day? Just a couple of days before, I had received a new tool in the mail to test. It was not only new to me, but new to the rest of the world as well, with it being officially introduced on Earth Day by Barebones. 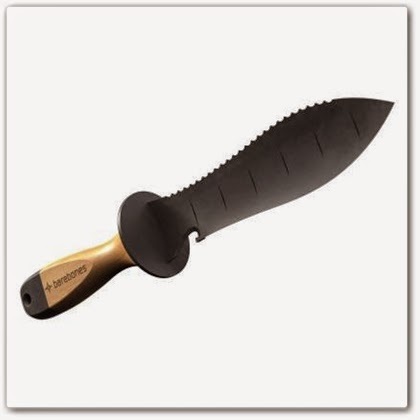 The Hori Hori knife is a multi-purpose tool that comes in handy in ways that might surprise you. Having its origin in Japan, the Hori Hori knife as a tool is not new to me and I have owned one for several years. It's my go-to general purpose tool, especially in spring, when I'm doing such gardening tasks as weeding, trimming, small digging, etc. Many companies make a similar version of it. So what makes the Barebones Hori Hori knife different or special from others? Though I haven't had much time to put it to heavy use, right off the bat I noticed that this is a heavy-duty tool. It has some serious heft to it. The handle is made of sustainable bamboo and the blade is rust-resistant tempered steel, giving it exceptional strength. One edge is standard sharp blade - with a bottle opener and twine cutter! - and the opposite edge is serrated. in measuring depth when planting bulbs. I'll be using this over the next few months to see how it holds up under use by a gardener who is notorious for abusing her tools, but I don't really have any concerns that it won't. You can tell it's a high quality tool that has had some thought put into its design. It feels really good in your hands. If I could improve on the whole hori hori knife experience, I would suggest that Barebones provide a leather protective sheath for it that can be attached to the waistband of my jeans. "At barebones, our products are designed to lift the poorest of poor while still being relevant to the richest of rich. Think about that for a moment. If we have products that will really do that, then those products are a great equalizer in lifting us all to a higher place. After all, we are all here on this earth together sharing a human experience. We can offer reliable power, provide sustainable living shelters, and teach sustainable food growth to every human being on this earth without overwhelming our resources. There is enough for all." A portion of the sales of Barebones products benefit TIFIE (Teaching Individuals and Families Independence through Enterprise) and Goal Zero. For more information about the Barebones company, their philanthropy, and their other products, visit their website here. 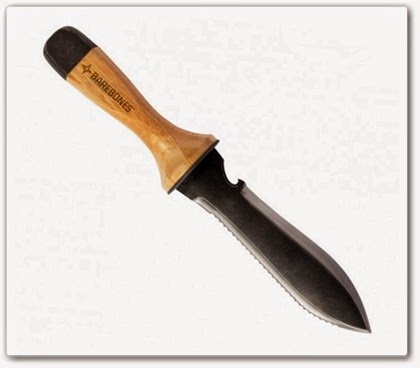 Want to win a Barebones Hori Hori knife? How would you like a Hori Hori knife of your very own? Barebones has generously allowed me to give one away to one of you! All you have to do is leave a comment on this blog post, telling me about your favorite garden hand tool, as well as fill out the Rafflecopter form below. In order to be entered into the giveaway, you need to do both things. It won't take you long at all. The giveaway will end at midnight EDT next Sunday night, May 3, 2015, so make sure you enter by then. Good luck! Note: I was given this tool by the Barebones Company to test in my own garden. I was encouraged to give an honest opinion of the tool, which any reputable company will do in order to get feedback for possible improvements on their product. As always, my opinions about any product I review are my own. I did not receive any compensation from the Barebones Company other than the tool I received for testing and will not receive any compensation from any purchases that come about as a result of my opinion about the tool. I picked this up today at The Anderson's in Maumee, Ohio, making it the first official plant purchase of the 2015 season. A fine choice, don't you think? Hybridized by Marietta O'Byrne, owner of Northwest Garden Nursery in Oregon, this fully double hellebore is just one of the Winter Jewels™ series. Of course, I want all of them. Having been the guest in homes outside the U.S., I know that different locations and cultures have what they consider to be proper guest etiquette. I try to take my cues from my hosts, but sometimes you just don't know what to give your host as a thank you gift for having you in their home, whether it be for a meal or for a few days. Huffington Post to the rescue! 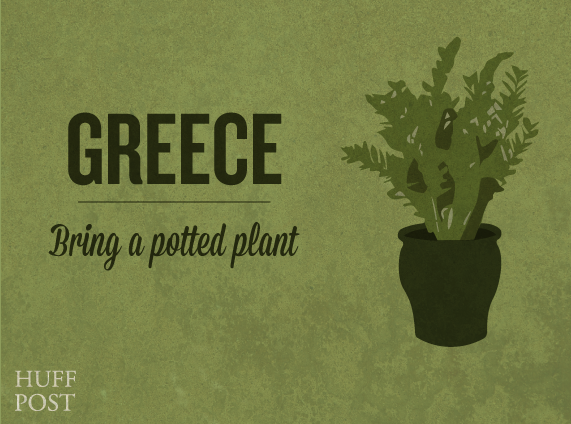 A cut flower bouquet is always in good taste for your host, now matter where you live, but in Greece, a potted plant is a common gift. Despina Trivoli, HuffPost Greece's Head of Life and Culture says, "The most usual gifts include alcohol, dessert (cake is very popular) or plants." Flowers in general are welcome, but usually potted plants are preferable -- something that will be able to grow in a balcony or garden. The second year of maple syrup making is now completed. We were first-timers last year and we beat ourselves on the noggins for not doing it before then. Eating real maple syrup made from the sap of your own trees is like a taste of heavenly nectar. We were just a tad late getting the trees tapped last year, so I watched the weather closely this year in order to take advantage of the sap season as long as possible. Sap begins to flow when the daytime temperatures are above freezing, but the night temperatures are below. Our first taps went into the trees on March 2nd and we found that the sap was already flowing, although not very fast. The weather up to that point had been unseasonably cold, delaying its start. In the four weeks that followed, we collected a total of 65 gallons of sap, from the same three trees we tapped last year, plus two more at the back of the property that were smaller, but we didn't get more than a couple of gallons total from those. The average ratio of sap to syrup is generally 37:1 for sugar maples and 40:1 for other types. We have mostly silver maples here and no sugar maples (maybe one, but it's too small to tap). We had two exceptionally good collecting days during all that time, with nine gallons being collected once and eleven gallons just a week ago before it all came to a halt. The sap stops flowing when the trees are finally all thawed out from winter and that is signaled by not only a reduction in sap flow, but a change in its color, from clear to light yellow. At the same time, the buds are beginning to break open on the trees and it's all over but the processing. see here. It was just easier to eyeball it to determine when the syrup was done. Taking into account the burned sap and one gallon that went bad before it got processed (it poured out of the milk jug in gelled globs), from 60 gallons of sap, we ended up with a little more than 1¾ gallons of syrup, making our ratio somewhere close to 32:1. Not bad! consistency and the darker it is, the stronger the maple flavor.